Savvy Spending: Today is National Frozen Yogurt Day! Here's where you can get a freebie or deal! Today is National Frozen Yogurt Day! Here's where you can get a freebie or deal! Today is National Frozen Yogurt Day! 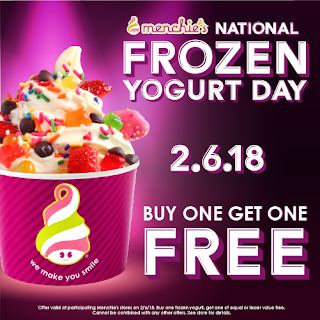 Here are some deals you can get on FROYO today! TCBY stores are offering a FREE 6oz Frozen Yogurt! Visit the TCBY Facebook page for details. Visit your local Yogurtland between 4 and 7 pm for a FREE 5oz Cup with unlimited toppings and a limited edition Hershey’s chocolate spoon! If you live near a Sweet Frog Premium Frozen Yogurt shop, you can spend at least $5 on Frozen Yogurt and get a FREE $5 Leap Back Card to use towards your next purchase valid through March 31st. Menchie's is offering Buy One Get One Free Frozen Yogurt, so stop by with a friend! You may watch the movie by merely clicking the play button provided online page.More information on freestreamingmovies click here.